← Ten Easy Ways To Join In National Bike Week in Princeton! Why Does Princeton U. Score So Badly On Walkscore? How walkable is your college? One way to measure this is to use Walkscore, which attempts to quantify how walkable any location is by calculating its distance from stores, services, transit and other useful stuff. We previously tested Walkscore and found that although locations in downtown Princeton get scores consistent with being a “Walker’s Paradise”, some other neighborhoods in Princeton are rated as ‘car-dependent’. With this in mind, we made a league table of Ivy League Schools based on Walkscore ratings from www.walkscore.com. Shockingly, Princeton University placed dead last! 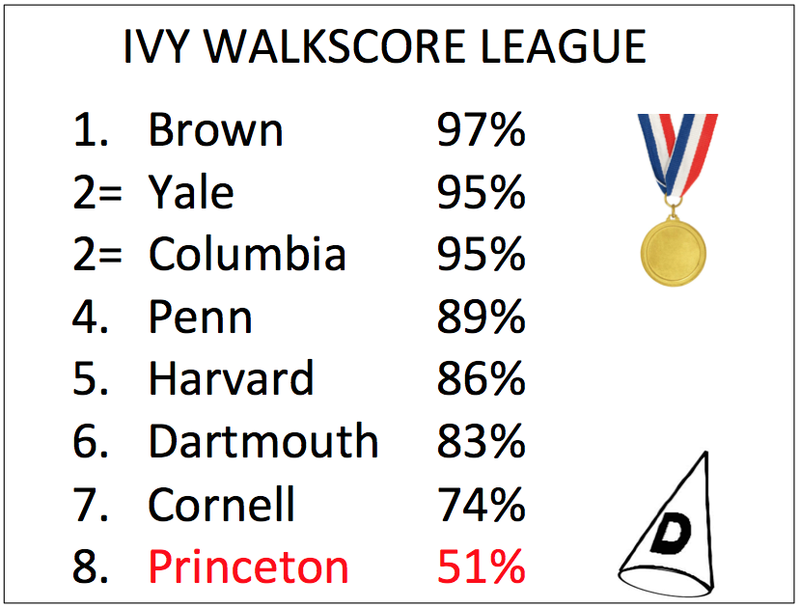 In fact, although the other Ivy League Schools showed a range of [pretty high] Walkscores -from 74% at Cornell to 97% at 1st-placed Brown- Princeton showed up as an outlier, with a Walkscore of just 54%! Explanation #1: This Walkscore Test Is Totally Flawed!! Our first reaction was denial: there must be something wrong with the test! And indeed, on further inspection, we find that the location that Walkscore uses for ‘Princeton University’ is, bizarrely, next to the Roberts Stadium! 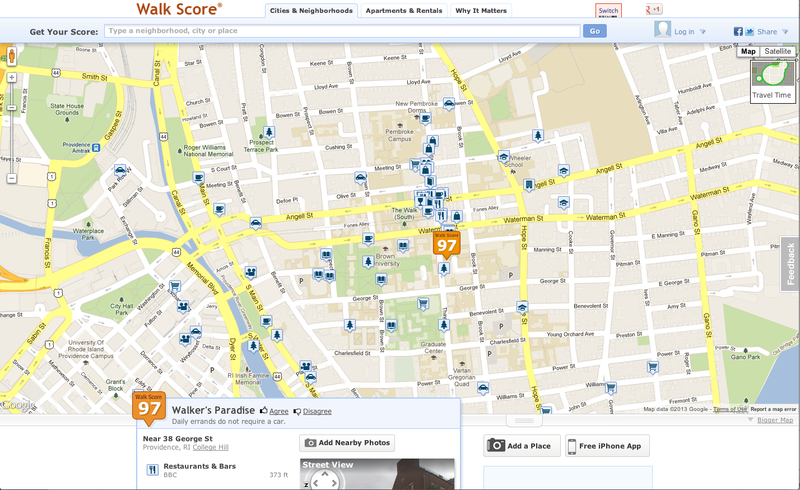 Screengrab of Walkscore for Brown University, showing how the campus is integrated around city streets. (Click for larger view). Explanation #3: Maybe Princeton Truly Lacks Walkable Options for Students? There is no doubt that Princeton University has an excellent campus that makes walking around an absolute pleasure for tourists and sightseers. But Walkscore doesn’t reward nice views, it measures how close you are to goods and services, and for many students, that is a challenge. If you live in somewhere like the Butler apartments, you’re at least half a mile away from anything. What’s more, even if you can get to the main Princeton downtown shopping area, many of the stores cater to the expensive end of the market. Some students have complained that reasonably-priced stores that cater to them are in short supply in downtown Princeton. Many services are supplied on-campus, reducing students’ need to look towards services in the town, but creating the ‘Orange Bubble‘ phenomenon. The idea that Princeton students have access to lots of walkable goods and services is also undermined by the fact that the University has to run a bus to ferry students to stores in strip malls down on Rt 1. At Walkable Princeton, we are in favor of policies that increase the retail options in the downtown area. Town-Gown relations are not just about arguing over PILOT payments; we should also work together to ensure that Princeton offers the best possible experience for students. A vibrant downtown with many useful goods and services is of much greater value to students than stores out on Route 1, and will make Princeton more livable and walkable for everybody. By providing the goods and services students want, Princeton can become a greater and more integrated College Town for students and residents alike. We’re interested to know what you think: are you able to access the groceries, restaurants and services you want on foot? What stores or improvements do you think would make Princeton more walkable? Leave a comment below..! This entry was posted in Downtown Vibrancy, Princeton. Bookmark the permalink. 4 Responses to Why Does Princeton U. Score So Badly On Walkscore? PU has moved Princeton’s station even further from main street. That shows its intention … walking? Pah!!! It doesn’t help anybody in the town that the Dinky is moving, but that fight is over now and probably we should think about what good stuff the new ‘Arts and Transit’ plaza will bring. The new Wawa will probably be the most important retail establishment around for most Princeton students, and like the current Wawa, will provide an essential walkable option. It will be interesting to see whether the new Wawa is just a remake of the old one or whether it will offer an expanded line of groceries and products. Walkscore.com seems to be inconsistent. 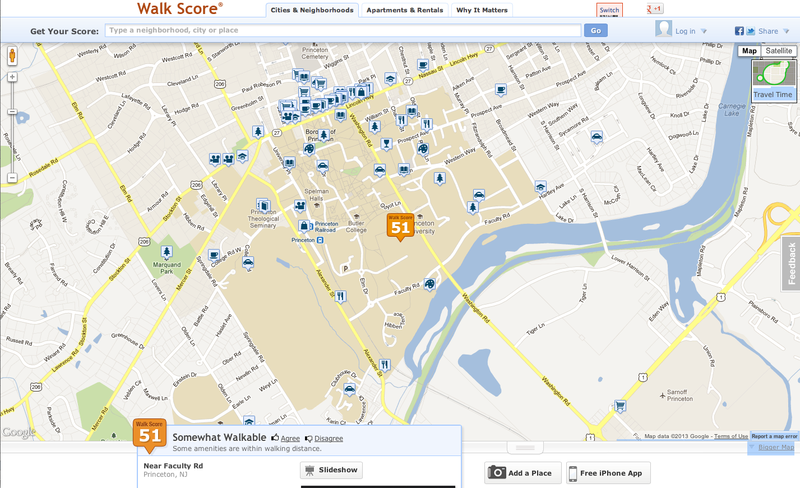 I just tried “Princeton University, Princeton, NJ” and was located at 70 Washington Road (CJL) and given a score of 69. Not gret, but far from a 53. Yeah that is a bit weird. To try to keep it consistent, we didn’t put in any address information, we just typed ‘Princeton University’, ‘Harvard University’, ‘Harvard University’ etc. It’s going to jump around a lot depending on the exact address used.